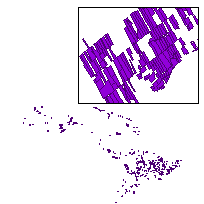 This data set is a polygon coverage that can be used to identify the location of an area of land that is of interest to the Crown as a result of an acquisition. Acquired land means real property where the Ministry of Natural Resources (MNR) has secured an interest in the land either directly or through an agent acting on behalf of MNR and title is to be in the name of Her Majesty the Queen in the Right of Ontario or a partner agency. This layer is part of what was known as the OMNR Non-Fundamental Dataset. Intended to map and report on acquired Crown land in Ontario. Updates are done on an "as needed" basis when errors are reported or as property documents are received showing the purchase of a property or sale or depatenting of an acquired parcel. Measure Description: Horizontal: Approximate: +/- 500 m may be more accurate in more populated parts of the province; Vertical: Not Applicable. Ontario Ministry of Natural Resources: LT3 Ontario Tenure data (LT3): Land Tenure Project data. Data compiled from various data sets, including Ontario Parcel Assessment and Crown parcel layers, FIM data, Natural Resources and Values Information System (NRVIS) Land Ownership data, District tenure layers.